This Manual and the accompanying CD provides qualified Structural Engineers with guidance on the structural design of single-storey and medium-rise multi-storey buildings using common forms of structural timberwork. 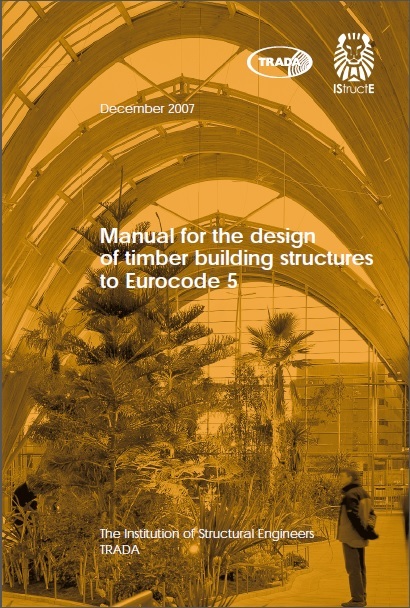 Structures designed in accordance with the Manual will normally comply with BS EN 1995-1-1: Eurocode 5: Design of timber structures – Part 1-1: General: Common rules and rules for buildings (EC5)1, together with its supporting codes and standards. The Manual is primarily intended for carrying out simple calculations, and is not necessarily relevant to the design of complex buildings requiring more sophisticated analysis. However it is good practice to check the output of complex analyses using simplified methods such as those provided. For simplicity reference to clauses in BS EN 1995-1-1 will be in the form ‘EC5 4.2(1)’ Reference to clauses in the Manual will be by section, e.g. ‘Section 2.1.1’. The structural Eurocodes are produced by the European Committee for Standardisation (CEN), its members being the national standards bodies of the EU and EFTA countries, e.g. BSI.